Author Charles Martin, who's behind the novel-turned-movie The Mountain Between Us, has written a book on Jesus’ life and ministry through a storytelling perspective. What If It's True? : A Storyteller’s Journey with Jesus, which will be released on Jan. 29, explores the fundamental question: “What if every single word of Scripture is absolutely true and I can trust it?" Martin, who has released 14 books in his career that spans more than 20 years, uses a storyteller’s imagination to place the reader in some of the most gripping and important scenes of the New Testament — from Jesus’ crucifixion to His miracles. The reasons for why he undertook this endeavor is something he explores not only in one of the first chapters, but throughout the entire book, sharing numerous moments from his own life where he could feel Jesus’ Words at play. “I don’t ever remember not knowing Jesus as Lord,” he said of his background as a Christian. “I have known the Lord a long time. It doesn’t mean I have always been obedient, but I’ve known Him,” he added. The author said that the inspiration to write a book like this, one that immerses the readers in striking detail in the life and ministry of Christ, came to him two novels ago. He explained that for many years in his career, he had simply been moving from one novel to the next, and he was known by everyone for his day job as a writer. Martin told CP that for over 10 years now he has also been leading a Bible study group. “Once a week I meet these guys and try to unpack Scripture for them. And so part of my life for the last decade or so has been teacher, somebody who spent a lot of time in the Word,” he noted. “Two novels ago I am sitting there and I thought ‘Lord, I would really like to put some of these teachings together in a book, if I could just figure out how to do it.’"
His books have reached millions, with the 2011 romance-disaster novel The Mountain Between Us turned into a movie in 2017, featuring major Hollywood stars Idris Elba and Kate Winslet. Martin positioned that the success of the novel has not changed anything about what he writes or how he writes it. What If It's True begins with what Martin described as “the single most important event in the history of mankind,” namely Jesus being led through the streets by the Roman soldiers to Calvary, where He is crucified on the cross. “A man like Jesus, who did the things that He did, He is either a nutjob, or He really is the Son of God,” he said. “Maybe this is why it took so long for this book to come out, because I had to ask the Lord ‘is it OK for me to write these things in this way?’” he revealed. As Martin admits, he didn't write the book as a theological exercise, and has no formal training in theology. Speaking of whether he has concerns about how people will interpret the book, he noted that after 14 novels, he knows that he has no control over how people respond to his work. ”I didn’t really spend a lot of time worrying about how folks would respond to it. I did spend a lot of time wondering ‘OK, I didn’t go to seminary, I don’t have training in theology. Have I written something that is not true? Is there something in my book that is blasphemous?” he said. Martin revealed that before ever giving his work to the editor, he handed it to seven other people who did go to seminary, or have been pastors for decades. “And I said, ‘Read this please, and tell me if I'm wrong. Have I written something that's just blatant blasphemy?’ And they came back with some suggestions about how to say things differently. But nobody came out and said ‘this is flat out wrong,’” he shared. One particularly powerful scene of Jesus healing a woman who was hemorrhaging, found in the Gospels of Matthew, Mark, and Luke, Martin relates to an experience years ago in Africa when he met up with doctors while working on a book. The doctors were treating women who had obstetric fistula, a condition caused by prolonged obstructed labor, which leaves women with uncontrolled leakage of blood, urine, and feces. In the biblical story, Jesus not only heals the woman, who believed He could help her even before He did so, but calls her "daughter," something which Martin says is very significant. He said it's an important story because the woman was bleeding through no fault of her own. “For us, we all carry wounds, often times that are not our fault. Granted, we are quite good at causing our own troubles. But with regards to her, she somehow represented the wounds that we all carry. All of us are bleeders. Only at the feet of Jesus is that wound made whole. Not only is the physical wound made whole, but deeper ones as well,” he observed. When Jesus calls the woman “daughter,” He not only heals her physically, but also heals her soul, Martin said, because she realizes she is a child of God. Stepping back, Martin reflected on how his audience has changed over the past 20 years. “Early on, it was probably mostly Christians. [But] today, I think there are those who are attracted to my fiction but are not necessarily believers. They like my storytelling,” he offered. Some nonbelievers even became angry when they realize that Martin is listed as a Christian writer, with the author sharing one such exchange, and the response he had for the individual, in a blog post he wrote last March. The reader says in part, "Problem is, you seem to have a lot of storytelling talent but when you start in with the Xtian crap, you lose most of your more educated, and open minded readers." Martin begins in his reply: "First, can I just say that I'm sorry. It sounds like some Christian somewhere wounded you. Please forgive us. We don't always get it right. Loving people like Jesus is not easy. I fail here often." “They pick at old wounds, because I think that’s the way the Lord works. He likes to heal wounds. So in order to heal them, we have to get at them first. I feel that a lot of times, my fiction picks at wounds, and people are upset at me for doing that. [But] my heart behind my fiction is to really show them how there is healing for that,” he continued. “In my nonfiction it is far more easy to draw that out, I can be far more specific. In my fiction, I have to raise emotions, and try to lead people to recognize those emotions” without beating them over the head with it, he said. 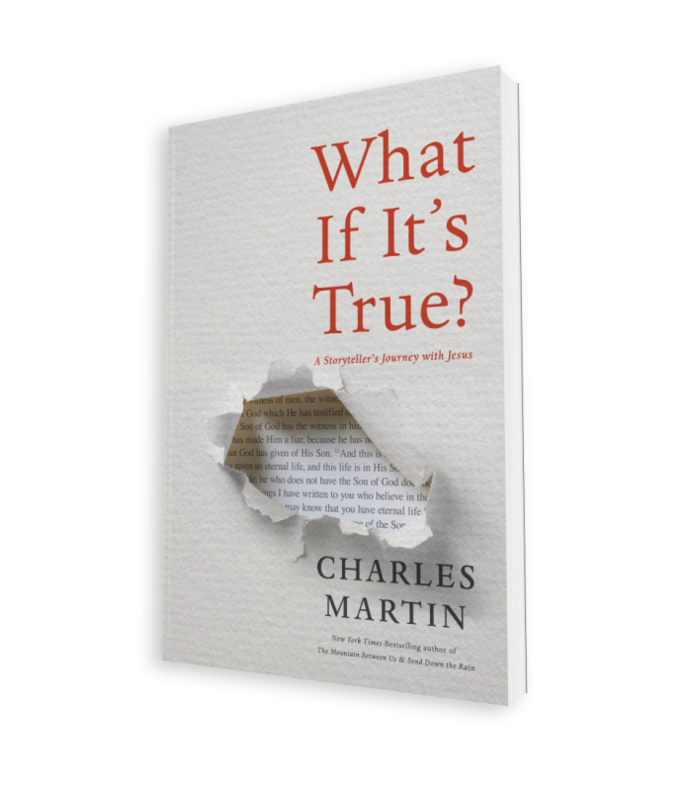 Going back to What If It's True?, Martin revealed that the reason he didn't write a prayer in the last chapter is because he felt like he has done his job, and led readers to wanting to pray themselves. “If His word is true, and I believe that it is — every word is absolutely true — then we ought to live somehow differently, it has to shake stuff loose in us,” the author concluded.